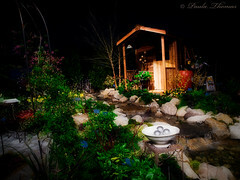 The 21st Annual NW Flower & Garden Show took place a few weeks ago. The owner has been trying to find a buyer but hasn't been successful. This was the first time I've attend the show and am glad I got to see it. I'm sure there were a lot more people there this year since it kept being advertised as the last one. It's the 2nd largest garden show in the US, or was anyway. Went to the show on Saturday afternoon and spent half the day walking around looking at all the neat stuff people were selling and all the fancy garden displays. I came home with an egg sack of preying mantes (a Google search told me that is how you spell the plural of mantis). I hunt the sack outside this weekend and hope to have lots of baby mantes hatch this summer to eat all the bad bugs in my yard. I finally finished uploading the rest of my pictures from the show last night and can be viewed in this set on my Flickr stream.